Today it features great shops, cafes, restaurants and tourist attractions. A fantastic place to stroll on a day in York or visit to take in some shopping, history and culture - also this year's winner of Google's Most Picturesque Street in Britain. Below we feature the latest Shambles news, its fantastic and things to see and do while visiting. 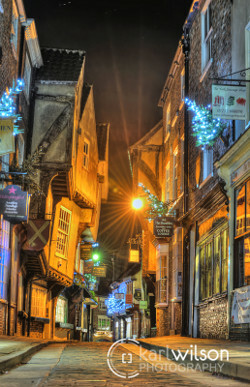 The Shambles is one of the most famous streets in Britain. 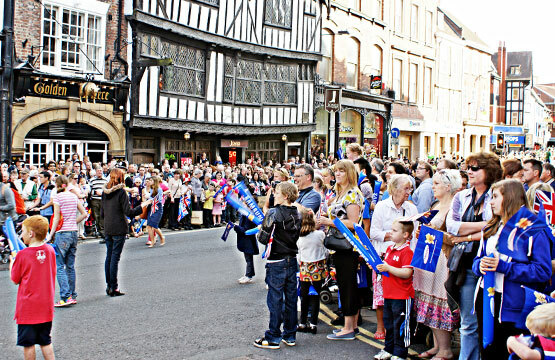 On the 19th June 2012 York Shambles and its residents were very proud to welcome the Olympic Torch on its journey through York on the way to London 2012. 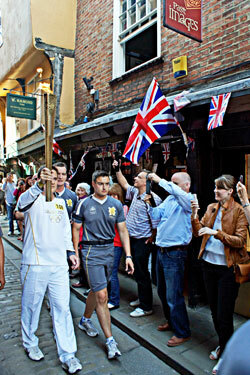 York welcomed the Olympic torch for 2012 with great anticipation. 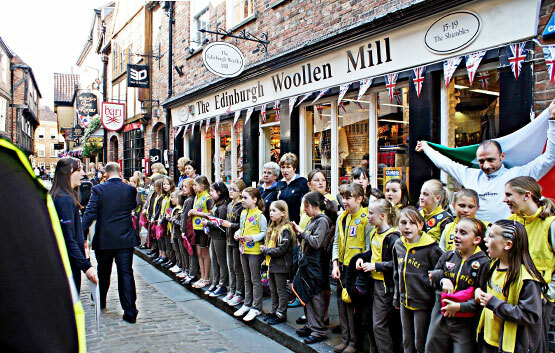 The entrance to York's historic Shambles was lined with people, tv crews, press and police. 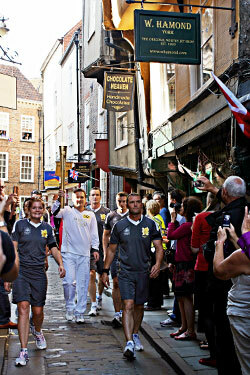 Our Torch carrier on the Shambles was 34-year-old Luke Young from Dishforth. He was chosen to run with the torch after cycling from London to Paris to raise money for charity. Visit the infamous York Shambles Penny Press machine which will features 4 brand new collectable York coins for purchase. The press flattens a one pence or penny and create a new pressed York coin. The designs for the York collectables can be seen below. Popular with collectors, residents, childen and tourists - York coins make great souvenirs to remember your visit to York! To get your coin visit the Shambles penny press machine which is out on the street every day between 10am and 4pm. Above: Shambles business owners / traders, Google Street Team officials and York councillor John Galvin. "This is great news, and I am delighted that the Shambles has received this award. The Shambles is a timeless street full of historic charm and whatever time of year you come here, there is something different to see. The Shopkeepers and locals have been fully behind this campaign from the start, putting signs in their shop windows and notices on the Shambles website. So it's fantastic, that those who love the Shambles that have voted it 'Britain's most picturesque street'. Google Street view is a great way of virtually walking down the Shambles, looking at the architecture, the cobbled street and even into shop windows from your own homes. To win this Google competition is a great accolade for the Shambles and York but also those who have helped preserve the Shambles for the enjoyment of the people of England." Here are the official results posted by Google. Today the Shambles is Europe's most visited street, attracting tourist, shoppers and business clients. We are proud to present this website which brings together the history, community and services of Shambles, York YO1 7LZ. 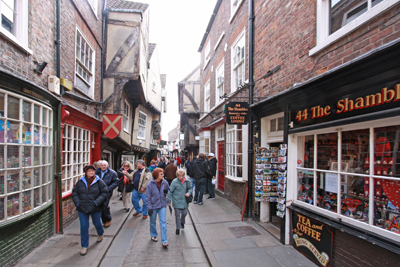 Shambles (also known as 'The Shambles') is a bustling centre piece of historic York. The street today is one of the UK's most visited and has become a wealth of shopping, tourist attractions, restaurants and many other things to see and do, including tours, ghost walks and historic talks. If you want to know York, you need to know Shambles. The way that fifteenth century buildings lean into the middle of the cobbled street means that the roofs almost touch in the middle. 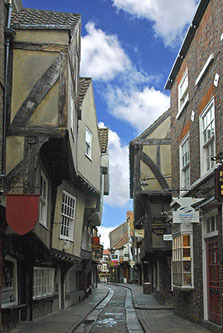 Mentioned in the Domesday book (making it date over 900 years), we know Shambles to be York 's oldest street, and Europe's best preserved Medieval street. It really is a very special place. The word Shambles originates from the Medieval word Shamel, which meant booth or bench. It was once also referred to as Flesshammel, a word with meaning around flesh; this is because Shambles was historically a street of butchers shops and houses. Records state that in1872 there were 26 butchers on the street. The last butcher to trade on Shambles was at number 27 of the name Dewhurst. Livestock was slaughtered on Shambles also, the meat was served over what are now the shop window bottoms, and these were originally the Shamels. It is also interesting to notice the way the pavements on either side of the street are raised up, this was done to create a channel which the butchers would wash away their waste through; offal and blood would gush down Shambles twice weekly. Half way along Shambles is the Shrine to Margaret Clitherow, wrongly thought to be her house (the real house is now thought to be 10 Shambles), the council bought this building and made a shrine. See below for more information on Margaret Clitherow. A butcher’s wife who lived in this famous street, she was brought up in the reformed religion, to which her husband also conformed (they were married in 1571). In 1574, however, she was reconciled to the Catholic church and allowed her house to be used for the shelter of priests and as lodging for a Catholic schoolteacher for her own children and those of neighbours. She kept this up for twelve years, during which time she was arrested on several occasions and spent a total of three years in prison. Eventually her house was searched, and, under threat, one of the pupils revealed where the Mass vestments were hidden. She refused to plead at her trial, wishing, she said, to spare the jury’s conscience; the penalty for this refusal was to be pressed naked beneath a heavy stone and left for three days without proper food or drink. The sentence was not fully applied, but she was crushed to death under a weight at the Tollbooth on the Ouse Bridge in York on the feast of the Annunciation in 1586. Her husband never returned to the Catholic faith, but one daughter became a nun, at Louvain in the Low Countries. Read more about Margaret Clitherow here. In this most historic of thoroughfares, sit amidst oak beams and tapestries and enjoy hot buttered tea cakes, exotic teas and coffees, delicious cream scones, hot dishes and salads. Enjoy the oasis of calm that is our secluded courtyard garden. The Shrine to Saint Margaret Clitherow. The house that was once home to Margaret Clitherow.